Song parodies are especially popular around Chanukah time. A Cappella singing has also increased in popularity over the years, especially on college campuses. Yeshiva University's singing group, the Maccabeats, has brought these two phenomena together by releasing a new music video this week, called Candlelight. It's a takeoff on a pop music video called Dynamite by singer, songwriter, and music producer Taio Cruz. The Maccabeats have been singing a cappella at YU since 2007. As they developed a repertoire, their music began to spread beyond the school and they have performed an eclectic array of Jewish, American, and Israeli songs for thousands all around the country. Their breakthrough piece, Lecha Dodi, combines some of the most beloved words of Jewish liturgy with Leonard Cohen's meaningful and melodic Hallelujah. In 2010, the Maccabeats released their first album entitled Voices from the Heights. We enjoyed listening to Candlelight and think it's a worthy addition to the growing collection of new songs for Chanukah. But it's going to take a lot of views for it to reach the 52 million YouTube views that Dynamite has accumulated since its release earlier this year. Will it reach anywhere near that number? You be the judge. Here's the video, followed by the original that it's based on. We should mention that Candlelight shows a lot less skin than Dynamite. Enjoy! 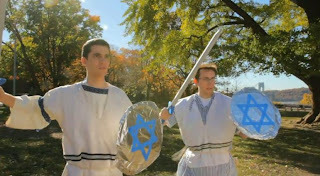 While we all love the Maccabeats (and hey, I'm friends with some of them), you should also check out this fantastic NCSY Chanukah video with hilarious pop-song parodies as well! This features real-life New Yorkers getting into holiday spirit and showing off their movies to Six13's great tunes.